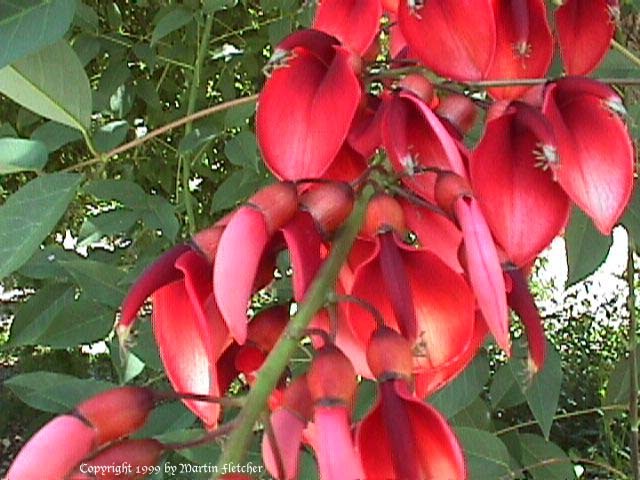 Erythrina crista galli is one of the hardiest of the coral trees. It has survived temperatures down into the low 20°s F and come back from even colder temperatures from the roots. Erythrina crista galli is sometimes grown as a very robust bush sprouting every year. It blooms strongly long sprays of red flowers in the spring. Erythrina crista galli gets up to 20 feet tall and wide when the conditions are kind. The Cockspur Coral Tree does have plenty of substantial thorns that do the common name justice. Blue flowers of Erythrina crista galli - Cockspur Coral Tree. High resolution photos are part of our garden image collection.